It is amazing to see the growth of Kaleb. He has gone from being born at 2lb 2oz to now a whopping 9lb 2oz. I wanted to put together a video highlighting the growth and NICU journey of Kaleb Craig. Thank you to our family and friends for all of the support, love, and prayers. I’ve unpacked most of our luggage from vacation. Laundry and dishwasher are both running. I’m now sitting here in the recliner researching and reading, trying to expand my knowledge on Kaleb’s latest diagnosis. I am reading about cerebral palsy, or more specifically, spastic diplegia CP. The movie Avatar is playing in the background. Why do I mention the movie playing when I have much more on my mind today after Kaleb getting yet another diagnosis added to his seemingly ever growing file? It’s because the choice in movie. Happy birthday Kaleb! Every birthday a person experiences is special but I'm not sure one has held so much significance for me as your first birthday. In some ways I feel that it is my own, since it signifies the beginning of my own transformation. I think back to this past year filled with all the tears, heartaches, prayers, cuddles, hope, and love. I am reminded of our bedtime story, I Love You Stinky Face. I read it to you each night while you sit on my lap nestled against me. Yes, it's the one that you try to hold and turn the pages while I'm still reading. At least once or twice during the story you will turn your little head to watch me with your big beautiful eyes as I read. I don’t have baby fever. Nope, not at all. Instead I’m the person tagging my husband on the story of the vasectomy celebration thrown by a wife for her husband. Complete with the snip snip hooray cake. However, when I see a big pregnant belly or hear of a mom talking about packing her hospital bag, the twinges come. This is when the twinges of grief and dare I say envy come in every now and then. I’m a preemie mom. 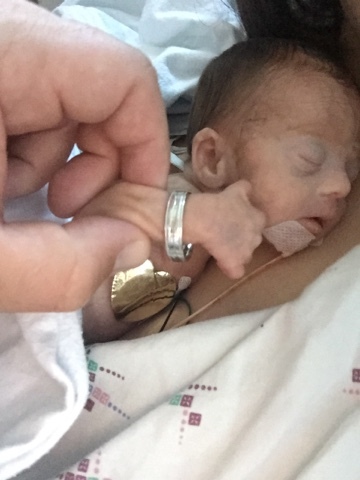 As preemie mom I lost out on the last three months of pregnancy. I just got to the third trimester in time to have my pregnancy unexpectedly come to an end. Suddenly, gone was my time to spend with my oldest as I savored the last little bit of him as my only little boy, my baby. Gone was the time of planning and prepping the nursery. And yes, gone was the time of sleepless nights, crazy feeling hiccups, heart burn, and aches and pains. Basically the unpleasant but proud markers of pregnancy.